I’m sitting in a taxi in the heart of downtown Yangon. My driver, incessantly honking at the traffic jam ahead, takes a pause to indulge in Myanmar’s national pastime: the chewing of betel nut. I’m adventuring through Yangon for a week, on a mission to explore a city that for decades has been living in economic and cultural isolation from much of the world. Many locals still refer to Myanmar’s largest city as Rangoon, its old colonial name, which still lives and breathes through endless streets where decaying buildings show their age, a cobweb of electric lines dangle above, and packed buses shuttle locals to and fro. It was only a few years ago that Coca Cola first hit shelves here, and rumour has it children lined up for hours to get their first taste. 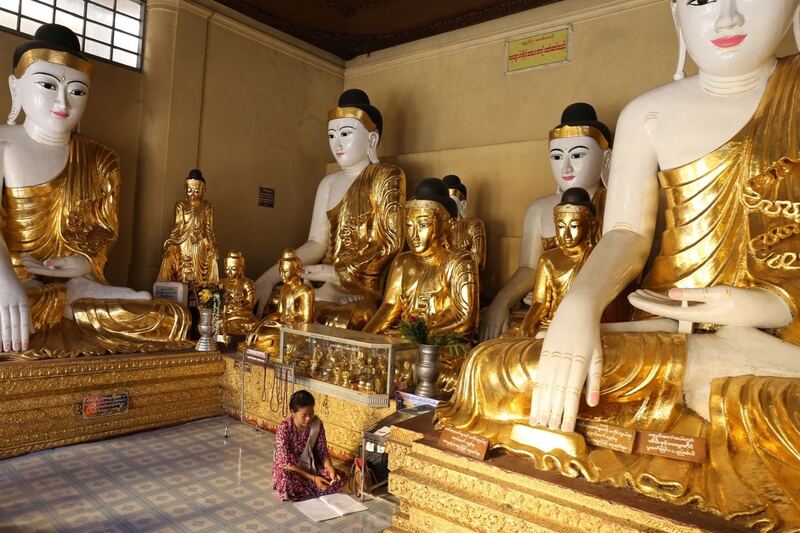 If there ever was a time to visit Myanmar, it is now. 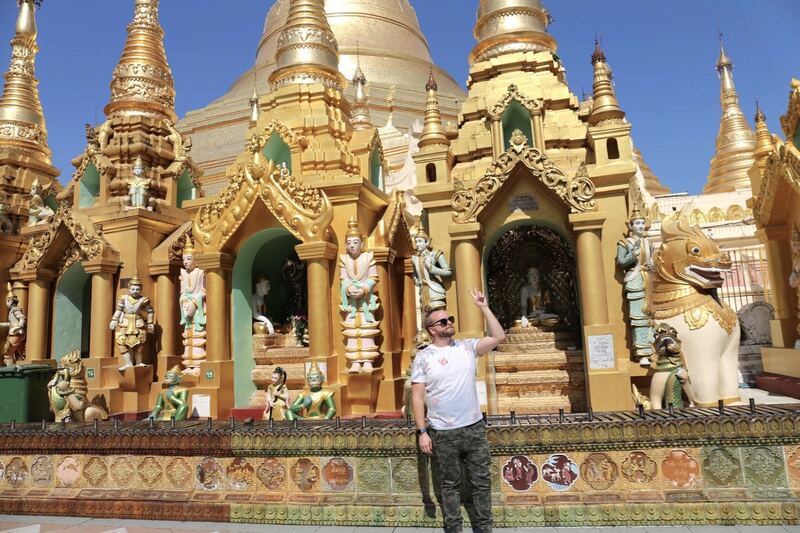 Tourists who have been curious to experience the closed-off kingdom are now pouring in as the government works around the clock with construction crews to launch the country into the present day. Myanmar had been sitting on my must-do list for some time, so I was thrilled to begin my much-anticipated Burmese adventure by touring the colourful streets of Yangon. 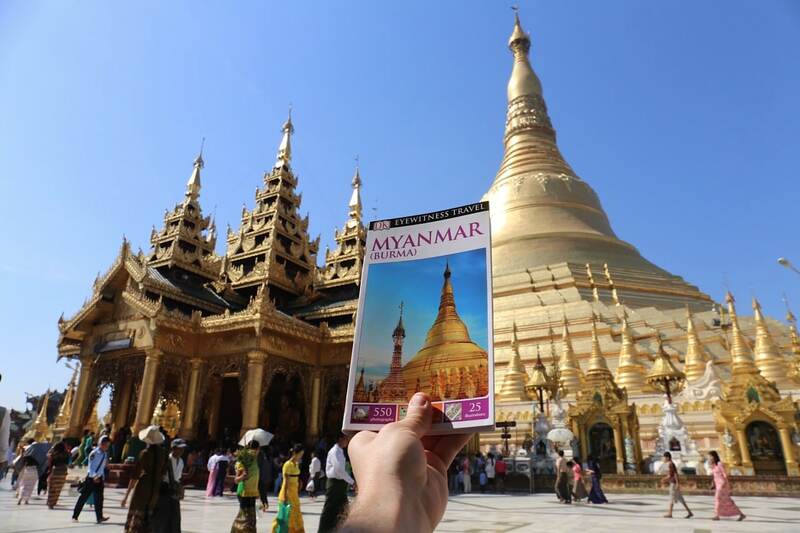 I researched the trip weeks in advance using the newest edition of Eyewitness Travel Myanmar (DK Publishing, 2016), which includes detailed itineraries and “don’t miss” destination highlights at a glance, illustrated cutaway 3-D drawings of important sights, floor plans for pretty pagodas, area maps marked with popular sights, top hotel and restaurant listings as well as a slew of info on niche interests such as Burmese culture, classic culinary offerings, and local products for shopaholics. Elegant piano music fills the air as you step into the luxurious lobby of Sule Shangri-La. It is here, at the iconic Peacock Lounge, where guests are welcomed by the hotel’s resident pianist who tickles the ivories under a glittering crystal chandelier. Sule Shangri-La comprises 479 expansive guest rooms and suites, each characterized by elegant décor and executive-style furnishings. Well-appointed rooms feature spacious bathrooms and outstanding views of the city, pagoda, or river. 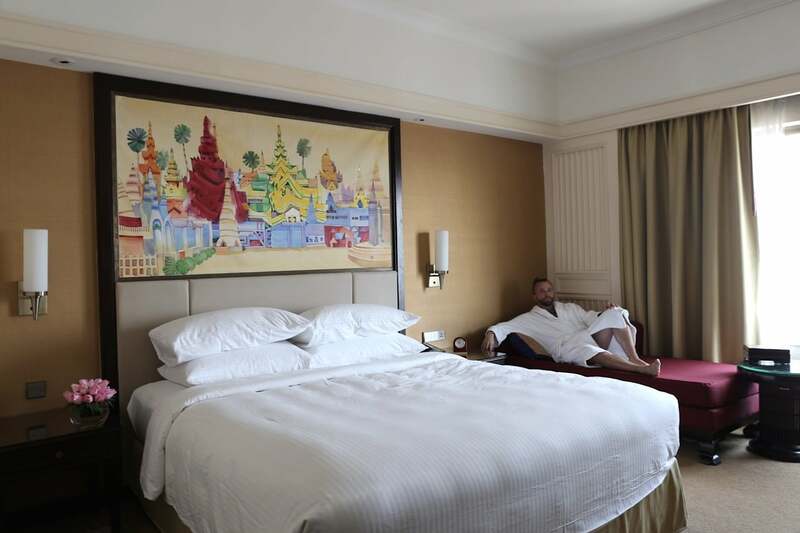 The layout of each room and suite is custom-designed to integrate seamlessly into the building’s structure, combining modern architectural elements and Myanmar culture. 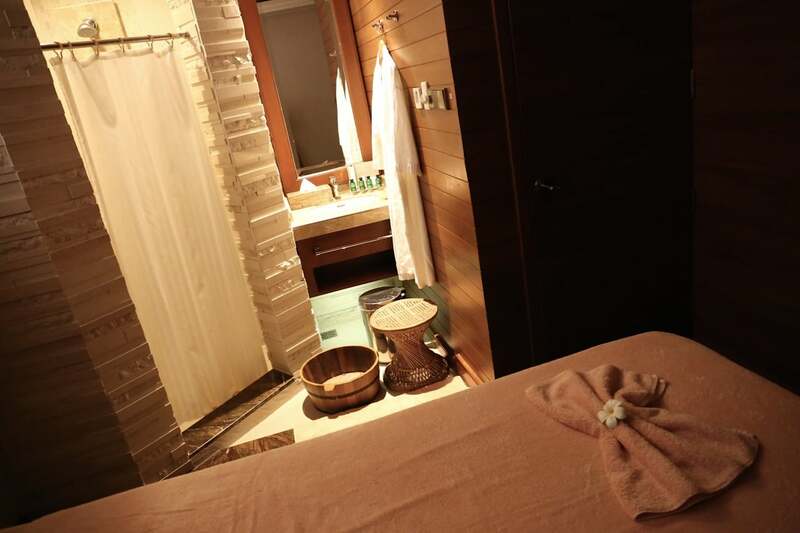 On the hotel’s fifth floor you’ll find a world-class Fitness Centre that provides guests with a spacious gym, outdoor swimming pool, sauna, steam room, and a petite spa where friendly therapists offer massage and reflexology treatments for those looking to indulge in a moment of rest and relaxation. If you’re keen to enjoy a pre-dinner sip and nibble, head to the hotel’s Gallery Bar, the first British-style pub in Yangon that opened when the hotel first launched some 20 years ago. 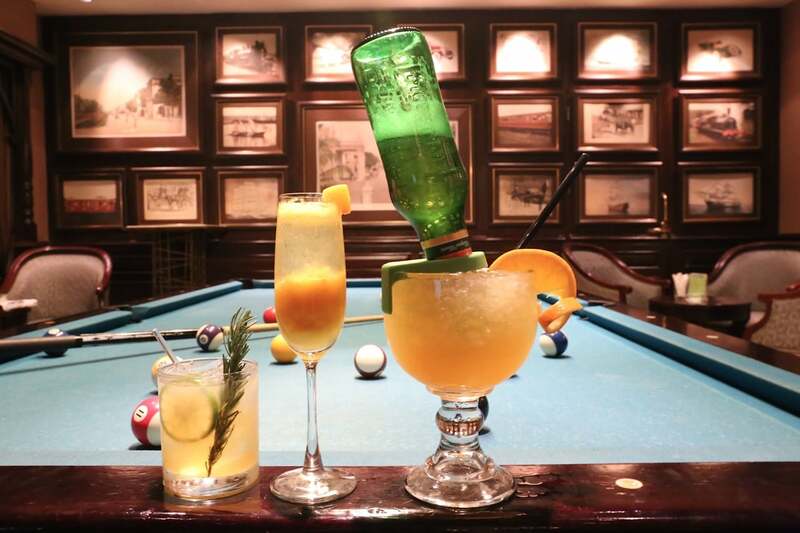 The charming interior features a billiards table and walls decked out in vintage portraits of city life. Be sure to order the bartender’s signature Mandalay Sour, featuring Myanmar’s only locally produced spirit, Mandalay Rum. Historically, downtown Yangon’s place to be for the who’s who has been The Strand Hotel. Opened in 1901, the Strand was developed by hoteliers Aviet and Tigran Sarkies, two of four entrepreneurial brothers who built a string of buzz-worthy luxury hotels throughout Southeast Asia, including the Raffles in Singapore and the Eastern & Oriental in Penang. 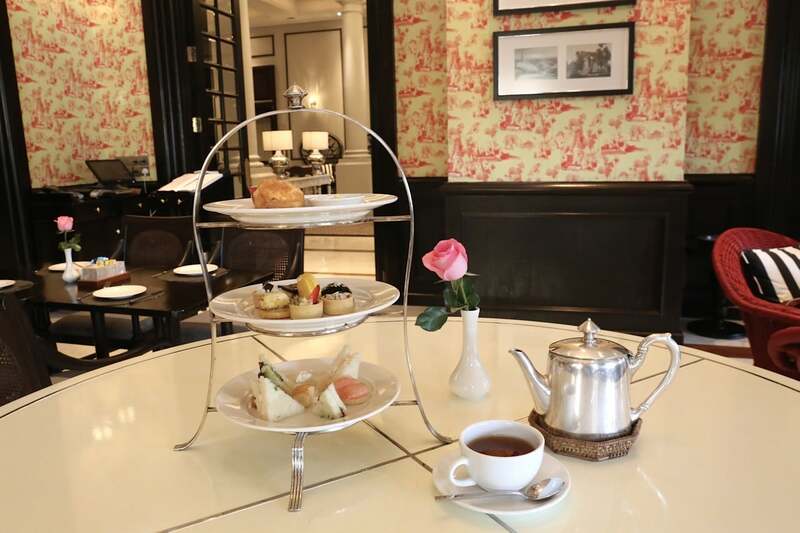 Today, The Strand Café offers guests the perfect setting to enjoy the hotel’s renowned High Tea. The dining room features original teak-framed windows, with polished flooring throughout, and lacquered fans hang from the high ceiling. Sit back and relax while sipping through a hot pot of loose leaf and nibbling jam-slathered scones, petite sweets, and savoury sandwiches. The city’s main freshwater spectacle is Kandawgyi Lake, created by the British as a source of clean water. Kandawgyi translates to “Royal Lake,” and its postcard perfect wooden walkways and bridges elevated on stilts in the water are the ideal spot to enjoy a quiet evening stroll. The most iconic landmark on Kandawgyi is the jaw-dropping Karaweik Palace, a giant, bird-shaped boat which was built by the government in the 70s to resemble the lavish barges Konbaung royals used to travel up the Ayeyarwady. 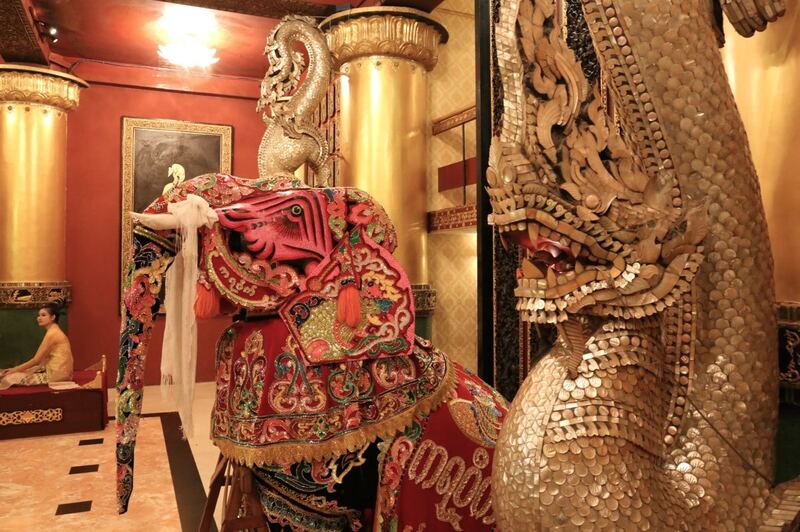 Each evening the boat’s elegant interior fills with visitors keen to feast on an epic all-you-can-eat buffet which is accompanied by a traditional Burmese music and dance show. The Secretariat was the home and administrative seat of British Burma. Built in the late 1800s, it was where Aung San and 6 cabinet ministers were assassinated on 19 July 1947, now commemorated as Burmese Martyrs’ Day. 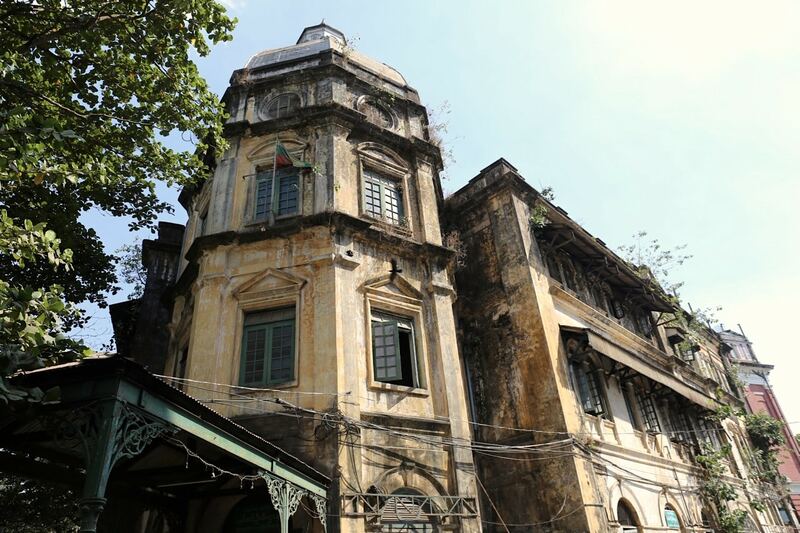 The building is currently on the Yangon City Heritage List, and after being completely abandoned for years, enthusiastic locals and curious visitors had a unique opportunity to explore the iconic building’s interior when Germany’s Goethe Institute presented a special exhibit by artist Wolfgang Laib entitled “Where the Land and Water End” in January 2017. 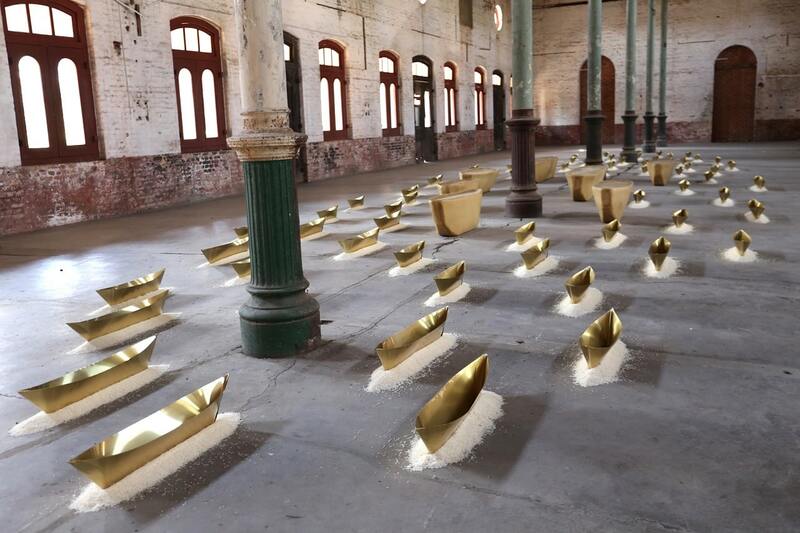 Many international art critics rank Laib as one of the 100 most important artists of our time. His works are part of the best art collections around the globe and in 2013 the Museum of Modern Art (MOMA) in New York dedicated a solo show to his extraordinary oeuvre. The exhibition at Yangon’s Secretariat lasted for just a short two weeks and highlighted the intention of the city to dedicate the unique piece of architecture in the near future to the city’s arts and culture scene. Facing City Hall is a small park named after the hero of the First Anglo-Burmese War. The sky-high obelisk at the heart of the park acts as a memorial to those who sacrificed their lives in Burma’s 20th-century struggle for independence. Pop by shortly after sunrise and skip across fresh flower-flanked lawns to watch as devout Tai Chi practitioners welcome the morning with magnificent movements. From the park enjoy a short stroll towards the river and you’ll find Yangon’s finest collection of colonial architecture, clustered in the area immediately east of Mahabandoola Garden and along Pansodan Street. 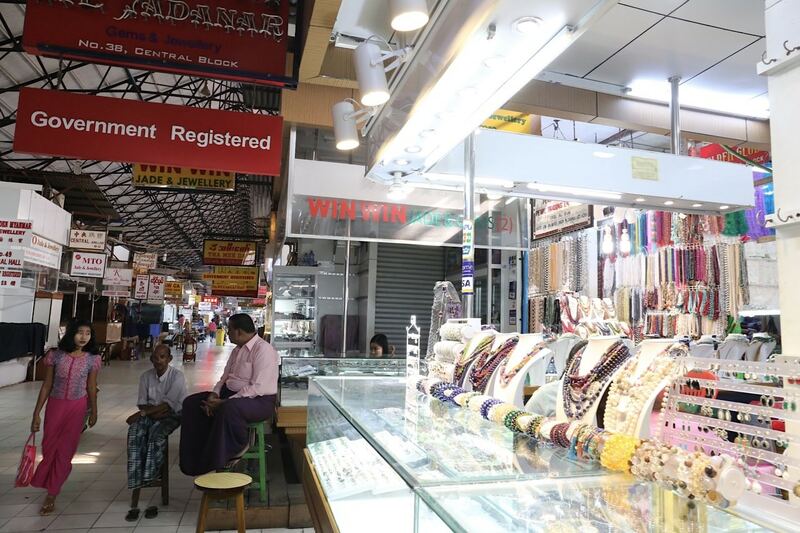 If you’re a shopaholic keen on taking home Myanmar-made trinkets and treasures visit Yangon’s lively Bogyoke Market. The foreigner-friendly Burmese Bazaar was first built in 1926 and today is filled with souvenir shops, jewellery stores and indigenous fashion emporiums where you’ll quickly find yourself swooning for sweet silk. If you’re looking to sip traditional Burmese tea head to Lucky Seven. 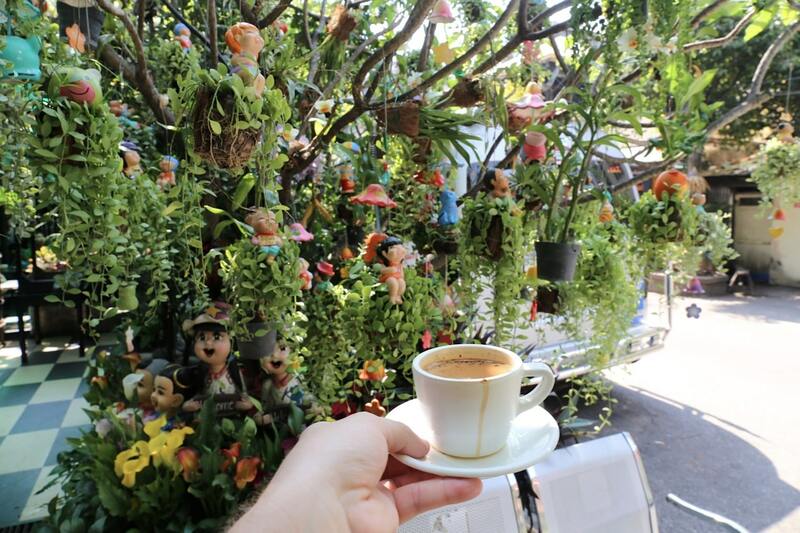 Its famous patio is surrounded by a gorgeous garden where you’ll find adorable toys dangling in the trees. It’s a perfect spot to spend the morning sipping the nation’s sweet tea, which I have to admit first tasted like hot chocolate to me. The wee cup had a distinct creamy sweetness which I later found out is due to the generous drizzle of condensed milk. I was tickled pink when a local friend bought us tickets to a sunset cruise, which spent three hours sailing up the Yangon River. 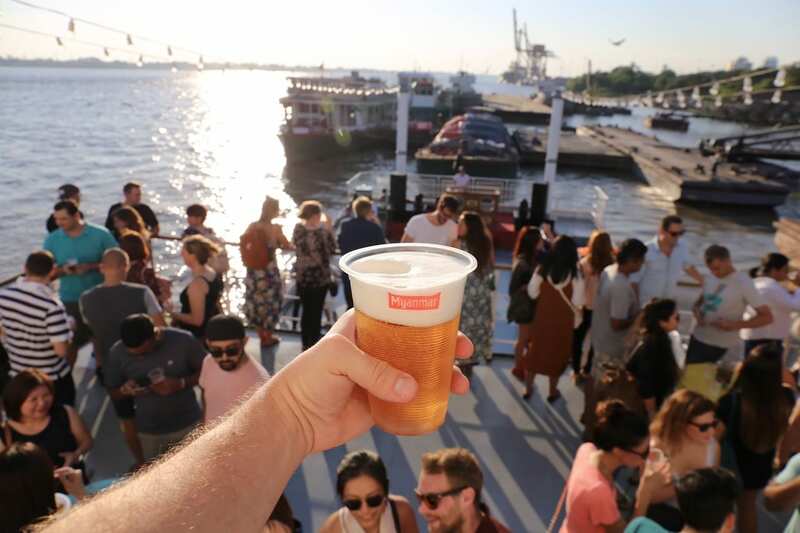 Once a month during high season the organizers host a popular party on a spacious three-story ferry. I spent the evening sipping local brew as a DJ entertained the crowd, rubbing shoulders with a mix of fashionable Burmese locals and resident expats who mostly work for embassies, NGOs and at private international schools. An unforgettable al fresco dance-a-thon under the night sky! 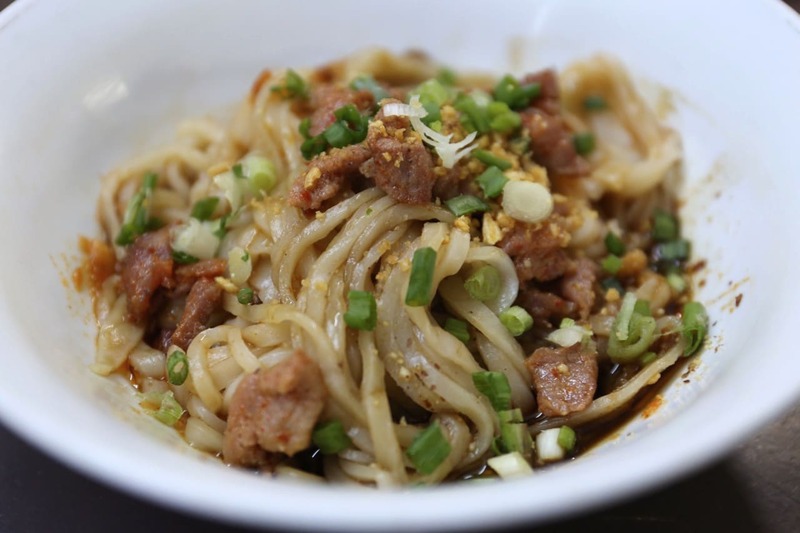 One of the top reasons I love visiting Asia is to experience each destination’s unique and vibrant street food scene. Head to Yangon’s Beer Bar Street (19th Street in China Town) which is lined with lively, Chinese-style barbecues after dark. It’s the best spot in town to people watch while devouring a seriously cheap feast. 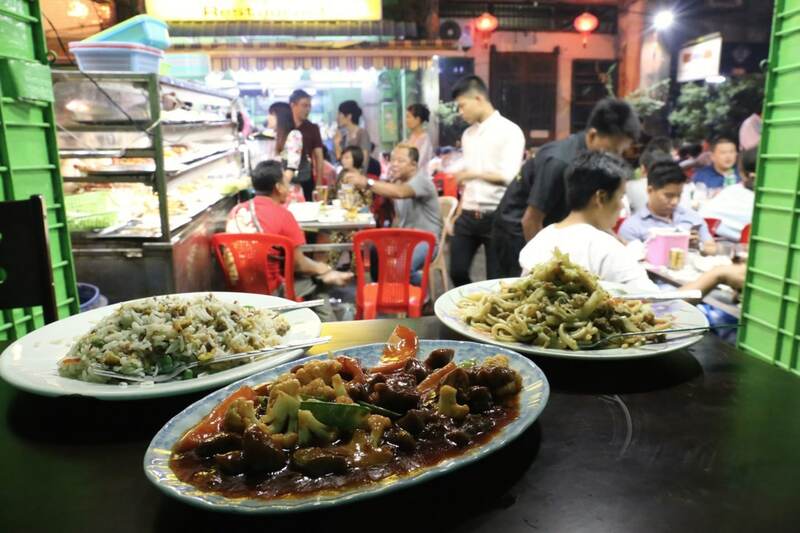 I sat perched over the bustling street sipping beer while wolfing down steaming plates of fried rice, pork topped noodles and sweet and sour chicken…all for just $6! Hla Day means “beautiful” in Burmese. 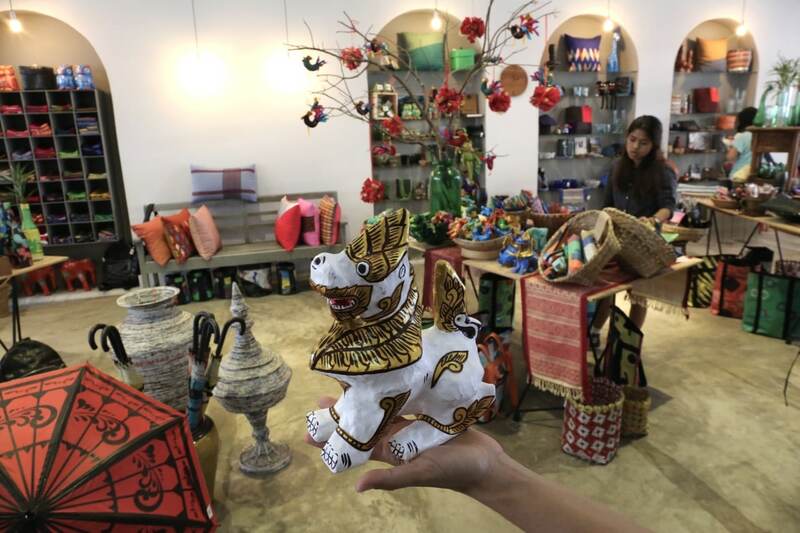 Yangon’s prettiest boutique doubles as a social enterprise whose owners work with Myanmar artisans, disadvantaged groups and small local businesses to design, develop, and sell quality products with a contemporary twist. The shop provides a sustainable market place, and business and design training to support the livelihoods of producers, many of who struggle to overcome disability, exclusion and poverty. Hla Day aims to capture the unique flavours of Myanmar design by locally sourcing materials and celebrating traditional skills enabling customers and producers to enjoy and benefit from unique and quality Myanmar handicrafts.